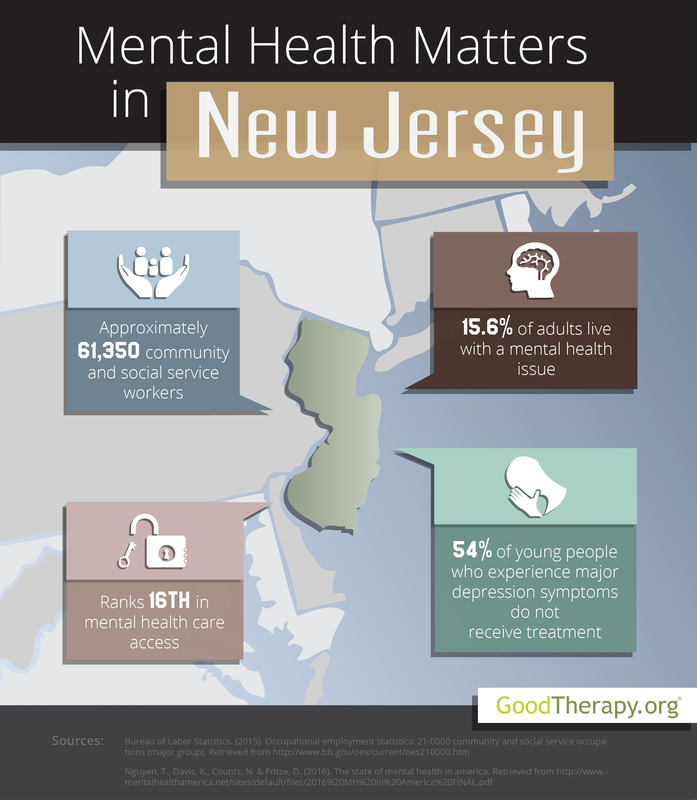 Find a therapist in New Jersey with GoodTherapy.org. In 2015, New Jersey had a population of about 8.9 million people, according to reports from the United States Census Bureau. It was also estimated that 72.6% of the population is white, 14.8% is black, and 9.7% is Asian. Elderly people—age 65 years or older—make up 15% of state residents, while minors account for 22.3%. Approximately 51.2% of residents are female. Reports from the Bureau of Labor Statistics (BLS) claim 61,350 individuals have occupations that specialize in community assistance or social service work. Specific jobs within this field may include working as a therapist at a depression treatment center, clergy member, parole officer, guidance counselor, religious worker, social worker, nurse at a residential treatment center, health educator, or a marriage and family therapist. In New Jersey, workers in these types of jobs earn an average of $53,790 annually. Mental health America (MHA) publishes a report on the state of mental health in the U.S. each year, comparing all states and the District of Columbia. In the 2016 edition of this report, New Jersey received an overall mental health rank of 6th, indicating a relatively high rate of access to care and a low rate of mental health conditions. Analysts from MHA and therapists in New Jersey believe a relationship exists between this high overall rank and statewide social factors such as lower occurrences of child maltreatment, low rates of poverty, high rates of graduation, and high rates of graduation for students with disabilities. The 2016 MHA report highlights New Jersey having the lowest percentage of adults with mental health issues—with 15.6% of the adult population affected—and is ranked 1st in this care category. The state also has the 10th lowest percentage of adults who experienced thoughts of suicide, and the fourth-lowest percentage of adults with dependence on alcohol or illegal drugs. Researchers from the Substance Abuse and Mental Health Services Administration (SAMHSA) state that in 2012-2013, roughly 7.1% of adolescents in New Jersey used drugs—lower than the national average of 9.2%. Mental Health America reports New Jersey was ranked 11th for young people with dependence on drugs or alcohol; 10th for young people who had experienced major depression at least once in the past year. The 2016 MHA survey suggests it may be challenging for residents in need of treatment to find a therapist in New Jersey. At present, the ratio of residents to mental health providers is 623:1. The 2014 SAMHSA study states the percentage of adolescents reporting improvements after therapy was lower than the national percentage in 2012-2013—60.6% to 69.3%; however 96% of adult residents report improved functioning after therapy, compared with the national average of 70%.